There are conversations I don’t want to have and there are conversations I show up in and where I don’t like how I show up there. How to change these? 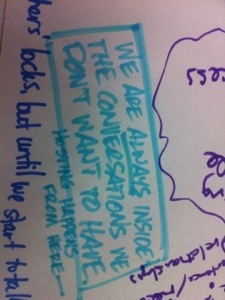 We are always inside the conversations we don’t want to have. We cannot leave them. We always have to host from inside this place. At some level you can never leave earth. You belong here and to every conversation that is happening here. You are invited to host it all. That is your obligation for being given the gift of life. I believe that no one has to show up or host any conversation they don’t want to participate in and/or host. I believe the root of being inside conversations we don’t want to have is that most in Western USA and, I guess, Canadian and maybe also Western European (I know less about Europe, and not much less about Canada– but I know ore about Canada!) no longer mentor young humas to listen to all the streams of data that come to us. I believe it is possible, indeed this is how life is supposed to work, where, if we learn to listen to our personal global positioning instruments, we always show up in the right place and always participate in the right conversations — the right ones for each individual. No single dialogue is right for all. We can develop our capacity to listen to ourselves better. Waldorf Schools are the only system I know that tries to shield children from the constant bombardment of cultural messages and corporate marketing, shielding children to discover themselves and then supporting children to unfold rightly. How to repair adults who have lived 30, 40, and, for me, as of August 16, 2013, 60 years who have been living without listening to all the data streaming at them. Nature streams data to us, the cosmos streams data to us. Rudolf steiner indicated that each organ in the body receives different data from nature/the-cosmos and he gave lots of instructions on how to develop our capacity to listen. Our bodies are our own personal global positioning sytem. If we develop the right inner capacities and this can be done through individual effort, study and practice, we never show up in the wrong place or wrong conversation. It is hard work, the work of a lifetime. Our culture, my culture, anyway, does not support such work, My culture focusses on training to make money and then spending money to keep the system in place going. If everyone learned to listen rightly to the cosmos, as it speaks individually to each person, NO ONE would ever find themselves in the wrong conversation,. But what I just wrote seems impossible. And it is, as long as everyone thinks it is impossible. The good news: we all really do live in open space. We can, and should, leave any conversation that does not feel right to us. Now is one is hired as a professional facilitator and is being paid to have a conversation and finds herself, oops, not wanting to participate — the dominator economic corporate culture would say the paid facilitator has to push on and do what she got paid to do. But what does someone really hire a facilitator, and the good ones are kinds of shamans, to do? To role model how to have conversations that matter. It could be incredibly powerful and meaningful and a great lesson for a paid facilitator to politely demur from participating in a conversation she is paid to participate in. Someday, if humans don’t snuff themselves and the Earth out, we’ll get it right and listen to our own personal global positioning instrument: our bodies coupled with our beings. It is very possible to not participate in a conversatin you don’t want. You write, Chris, that, on some leve we can never leave the earth. You say ‘you belong here and to every conversation happening here”. I disagree. I do not belong to conversations taking place on this planet that support fracking or Monsanto genetically modified food that is patented and not labeled. I do not belong in conversations about slaughtering humans with drones or war. If more people opted out of conversations they don’t really want to have, maybe there would be less such conversations. Wrong conversations can’t happen unless people let them. I want to go on and on. Stop this world and let me off. I don’t belong here. My heart is too tender, my feelings too fragile. I feel assaulted as soon as I awake in the morning and as I move through my days, often feeling this way even when I am engaged in the too-small positive efforts with wonderful humans because I am overwhelmed by all the wrong conversations taking place. Withdrawing from a conversation is doing something to change how the world unfolds. It might look like nothing but it is something. And I can check out, even from the Earth. I don’t see how I can check out of the Cosmos, however, which is what keeps me here on the margins, waiting to be released. I find these comments intriguing. Chris, your thoughts remind me of Pema Chodron’s title, The Wisdom of No Escape, that we are part of everything. Tree, I feel blinding white light from you given the mass destruction humanity faces. I travel through northeast Alberta for community development work and was startled by a recent conversation with a friend/colleague. We were talking about the increasing number of oil wells on farms in the area. She and her husband have 12. They have no choice about oil wells being there but try to work with the company to steer away from the river. My friend is developing gluten free food, invites kindergarten children to come and see what animals look like and how they live. She is active in several local boards and I met her at a meditation retreat a few years ago. We live in a complex time. I give thanks for my friend who lives on a farm in a way I could not, for Chris who wants to host where he is, and for Tree who perceives a space she needs to maintain. Valary…you put this beautifully. Thank you. Willow, the rest of the scratches on the poster don’t really matter as they were random notes from three rounds of world cafe, but I was really struck when our conversation took this turn. Tree…thanks for your thoughts. I find myself WANTING to not be in the conversation about fracking, but everything I do in my life is predicated on the energy that is gained from that technology, so I am already IN that conversation, on a macro level. I resent that I have been dragged into that conversation, and yet I participate in it, perhaps silently, or perhaps visibly, as I am doing right now. But, given the current economic situation, it is incredibly unlikely that there is not a single person in Canada or the US who is not depending on shale gas for some aspect of their lives. In that sense we are always in the bigger conversation, and our silence or withdrawal is like leaving a circle but staying in the room and being subject to the decisions that the circles makes. In Canada if we ignore the energy policy that is being developed and all of the oil in the tar sands is burnt, we will destroy the atmosphere. Simple, in some ways because the consequences of opting out are rather enormous. We are the systems we want to change. But we are often the last ones we expect to change.